Plasma Cutters, and its intense heat (up to 22,000C), is created when gas is ionized by electrical energy. Powermax systems use plasma to melt metal, and compressed air or nitrogen to blow the molten metal away, leaving a good quality cut edge ready to weld in most cases. Powermax systems are also effective for gouging metal. 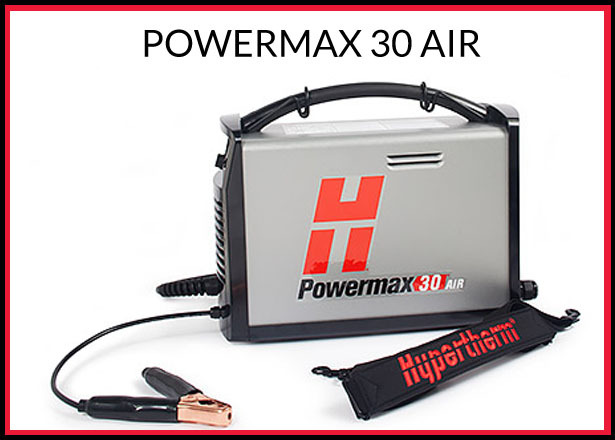 The new Powermax30® AIR delivers high performance in a compact, portable package. 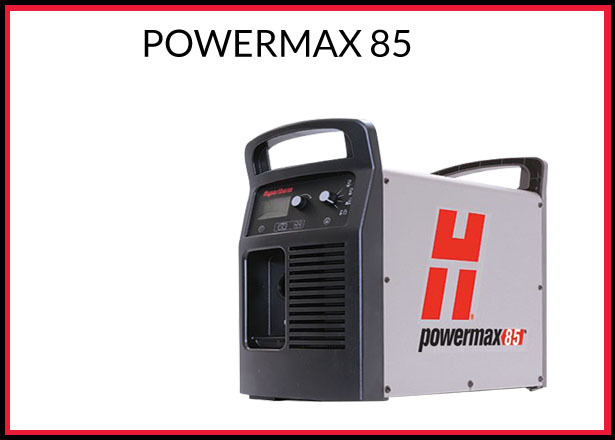 With a built in air compressor, it’s the smallest, lightest handheld plasma cutting system in its class so you can take the Powermax30 AIR to where the work is rather than bring the work to the system. Because it’s highly portable, it can be used for a wider range of applications. It’s also simple to setup and operate. You can plug it into any 120 or 240V circuit with the supplied adapter plugs. 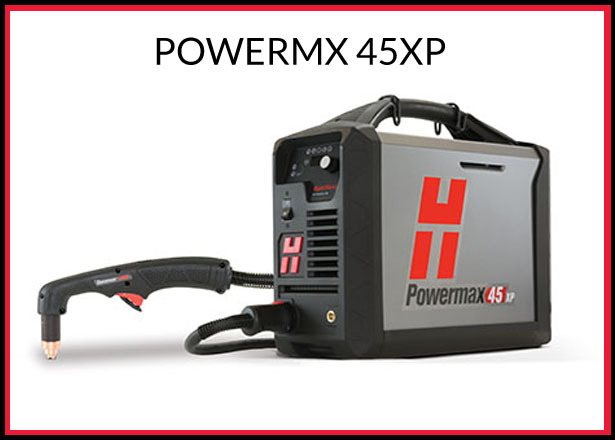 Our best selling system, the Hypertherm Powermax 45 is the most versatile and portable 1/2″ (12 mm) machine on the market, with a broad set of application capabilities that make it a truly multi-purpose tool. The Powermax45 cuts or gouges faster, easier and better than any other product in its class. Hypertherm Powermax 65 Offering the latest technological innovations, like Smart Sense™ technology to automatically adjust the gas pressure, the Powermax65 helps you do more than ever before. Seven Duramax™ torch styles provide greater versatility and enable operators to select the right tool for the job. 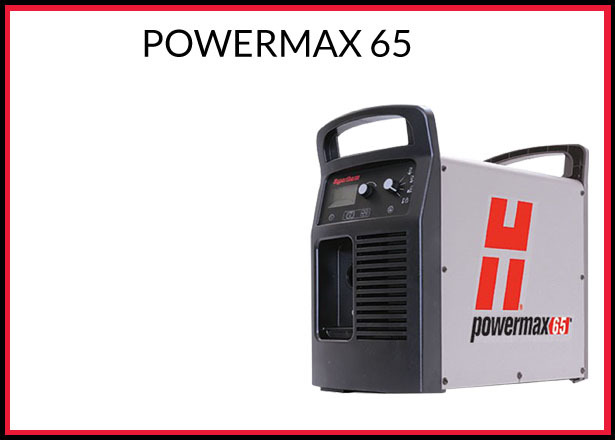 The premier system for cutting 1″ (25 mm), the Hypertherm Powermax 85 has the same features and options as the Powermax65, but with more power from a max output current of 85 amps. A variety of Duramax torch styles provide exceptional versatility for hand cutting or gouging, portable automation, X-Y table and robotic cutting or gouging. 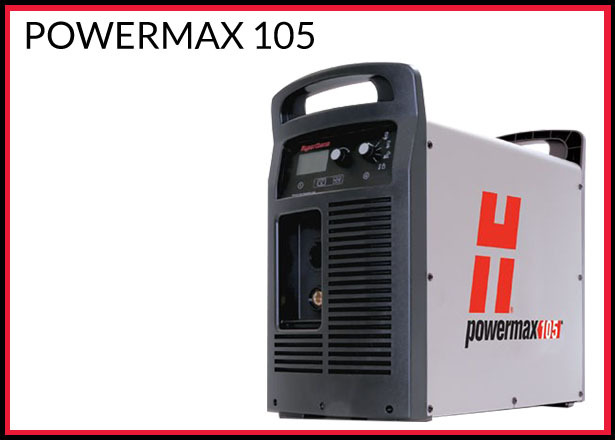 The Hypertherm Powermax 105 delivers superior cut capabilities on 1-1/4″ (32 mm) thick metals. It has the duty cycle and industrial performance necessary for tough cutting and gouging jobs. Seven Duramax torch styles provide versatility for hand cutting, portable automation, x-y table cutting, and robotic cutting and gouging. 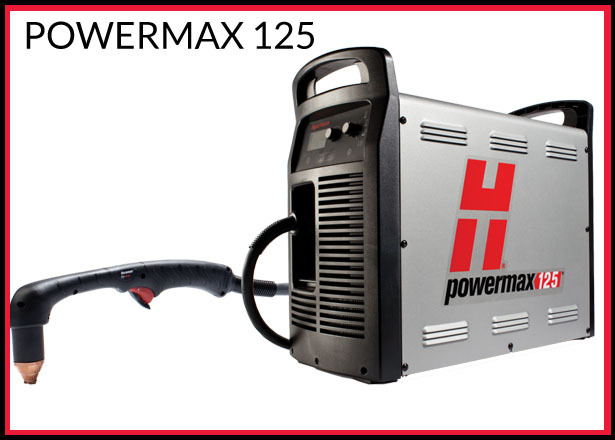 With the maximum power and performance for air plasma, the new Hypertherm Powermax 125 cuts fast and thick. A 100% duty cycle, a 1″ (25 mm) mechanized pierce capability, and a gouging metal removal rate of 27.6 lbs/hr (12.52 kg/hr) make the Powermax125 the tool for any industrial cutting and gouging job. Compressed air – shop air, portable air compressor or bottled air. Nitrogen is often used for stainless steel. Safety equipment, including shaded glasses or face shield, gloves, protective clothing and proper ventilation. Whether in a shop, factory, at home or in the field, Powermax plasma cutters system cut and gouge all metal types and forms. Most models are available with a handheld or machine torch to fit the application.